Crosslake Area Senior Services is hosting the "Power of Aging Expo" on Sat. April 27, 2019. Recently retired after working 50 years as a sportscaster for WCCO, Mark Rosen has been named Best TV Sportscaster for City Pages a number of times and has recently been inducted into their Hall of Fame. 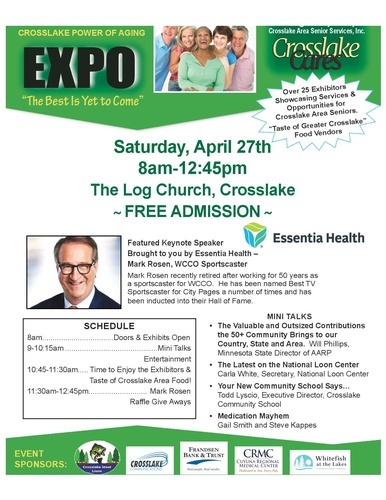 More than 25 exibitors showcasing services & opportunities for Crosslake Area Seniors, Crosslake Cares is hosting an event to inform seniors about its organization. Local restaurants will be invited to provide samples of food for attendees.